Coastal Home Care, Inc. Statesboro Branch Community Alternatives Group is providing to a group of those with developmental disabilities is priceless. 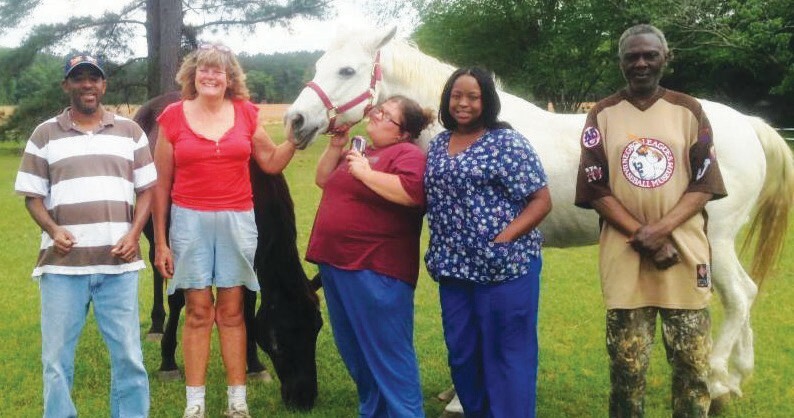 Through their work with Julie Barnes and the animals in her care, these individuals have the opportunity to socialize with rescued animals and understand the value of being kind to all creatures. Heart of Dixie Equine Rescue was started in 2008 by Julie Barnes in order to fulfill a lifelong dream of ‘giving back’ in a truly meaningful way. She knew through her research and involvement with animal rescue over the years that more than 60,000 homeless horses in the United States are sent to horrible deaths each year. Since 2008 Heart of Dixie has rescued horses privately. They are now in the process of applying for their non-profit status which will allow them to broaden their rescue outreach. The services Coastal Home Care offers to those with developmental disabilities has expanded its reach to all areas of coastal Georgia as well as Waycross and Barnesville. Through DBHDD programs for community living, supports and access they provide caregivers who are especially trained to work with these individuals. As my visit concluded, the group showed me the tilled rows awaiting seeds for their summer garden to provide food for the horses and to sell at the local farmers market in support of the rescue. It wasn’t clear to me who was getting the most from this, the individuals or the animals. However, I saw clearly the power of animals to instill peace in others.